Tang Lung Street was always the grungiest thoroughfare in Causeway Bay – but, alas, the force of gentrification has finally caught up with it. Formerly a back alley populated with plastic-chaired dai pai dongs and green tea-and-whisky-guzzling karaoke bars, this street has now been given a modern makeover to make way for a more sophisticated crowd. It’s now home to two shiny new buildings – one of them being Soundwill Plaza II – Midtown, which is home to a shiny new gastropub: The Chop House. The latest enterprise of the Wooloomooloo Group, The Chop House extends its gastropub experience from Singapore to our city, touting international dishes with a contemporary spin. But what draws our attention when we step inside isn’t the menu. It’s the strange beer taps that are fixed on to many of the tables. These are actually self-serve draft taps for Tiger or Heineken beer. Customers just need to buy a special card ($300) to activate their device and they can serve themselves brews until the money runs out. This sounds dangerously fun – and we make a note to return with a crowd. Expect a menu full of meat here. After all, the name is The Chop House. But there are good seafood options too. To start, we order the crispy calamari ($105) and The Chop House specialty pork burger ($155). The calamari is golden fried and crisp, as well as being well seasoned. Even the coleslaw on the side is well balanced, without its dressing being too overpowering. The squid is cut a little too small, though, making it look more like fish bait than the usual fat calamari. The burger is a tasty affair too. 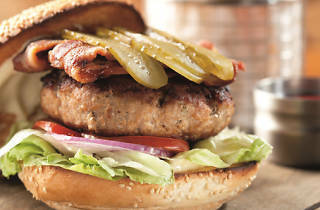 The seasoned patty is hearty and it’s served with freshly sliced gherkins and bacon. 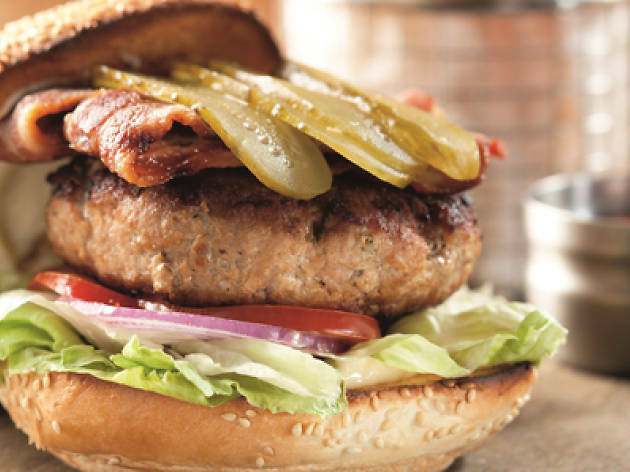 Okay, pork is never going to be as juicy as beef when it comes to burgers, but with the pickles and bacon, there’s enough grease to make this an indulgent winner. We also try the New Zealand sirloin ($298), which is succulent and tender, as well as being expertly enhanced by accompaniments of zingy pickled beetroot, onion chutney and tangy honey mustard.